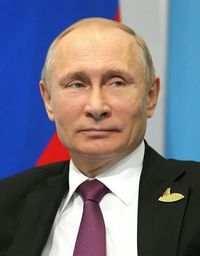 Vladimir Vladimirovich Putin (Russian: Владимир Владимирович Путин) (born October 7, 1952) was reelected president of the Russian Federation in 2012, after serving as prime minister since May 8, 2008, and previously serving as president since December 31, 1999, the day Boris Yeltsin resigned from the presidency. A Christian, Putin leads the increasingly conservative Russia against the homosexual agenda and towards pro-life side. Much of the criticism of Russia by liberals in the United States is motivated by their opposition to Russian policies on social issues. Obama even refused to attend the Winter Olympic games held in Russia in 2014. Forbes ranked Putin as the most powerful man in the world as of December 2016, while Obama was ranked #48. Putin gains popularity every time he challenges the U.S. or Europe, or sends troops into Georgia. Putin's Russia is an authoritarian system, with restricted capitalism, a rubber stamp parliament, compliant media, imprisoned or exiled oligarchs, harassed NGOs, marginalized pro-Western democratic parties, and a foreign policy based on bullying and military strength, all based on money from oil and gas. In March 2018, Putin unveiled his re-vamped nuclear missile program, and used the opportunity to threaten the United States of America and the Western World. Putin was born in Leningrad on October 7, 1952 and was baptized as an Orthodox Christian and continue to be a member to this day. Putin was a judo champion in his youth. He was educated in law and economics at Leningrad State University before being assigned to work in the KGB. After five years in East Germany, he took up various political positions before becoming prime minister in 1999. He was married to Lyudmila Putina, a former stewardess with Aeroflot, from July 28, 1983, until 2014, when the two divorced. They have two daughters. A Christian himself, Putin governs a nation that is rapidly becoming more Christian and more conservative, and his snubbing of liberal Obama in May 2012 suggests that Putin is well aware of how conservative his country is becoming. On social issues and taxation, Russia under Putin is more conservative today than the Western Europe. In terms of achievements, Putin has successfully opposed the homosexual agenda and has supported pro-life reforms. He has also stabilized the Russian economy and restored Russia's national pride, largely by politically exploiting the financial windfall of Europe's need for Russian oil and gas. Russians were enthusiastic that he ended the social chaos that followed the collapse of the Soviet Union in 1991 and the subsequent pell-mell privatization of the state-owned economy. Many Russians have been mesmerized by the new glitter of Moscow and the restored glamour of St. Petersburg. Russia's revived self-pride follows the humiliation of the chaos after 1991 and the incompetence of his predecessor Boris Yeltsin. Russians have a long history of authoritarian governments and a strong diastase for anarchy. They have little experience with freedom. The Russian mafia, which is more sophisticated than its counterparts elsewhere, controls more than 40 percent of the total economy. Their control is thought to be even greater in certain areas, such as banking, real estate, and consumer markets. In November 2014, Putin started allowing his citizens to own concealed firearms for self-defense. Russia under Putin made it illegal for foreigners without a permit to preach, and banned cults that engage in family shunning. Not having a permit is why a Baptist pastor came under persecution. Blasphemy against the church is also illegal. Putin is mainly backed by the United Russia (Единая Россия) party, which currently holds a majority in the lower chamber of the Russian parliament, known as the Duma. The party usually reflects the political views of Putin, which are that of moderate conservatism and nationalism. On March 14, 2004, he was elected to a second term as president with 71% of the vote. Barred from a third consecutive term by the Russian constitution, Putin ceded the presidency to Dmitry Medvedev on May 7, 2008, and became Prime Minister, at the time sharing power with the more moderate Medvedev. Medvedev did not run for a second term, and, as a result, Putin was re-elected in 2012. Putin is an active interventionist, which brought Russia back on the world stage since the fall of the Soviet Union, this is one of the most important reasons why Cold War features takes back, especially with the United States which is the only world superpower after the end of the Cold War. Putin has even exercised power over the Russian supreme court. Justice Vladimir Yaroslavtsev was forced to resign after warning that Russian security agencies now control the country as they did in Soviet times and expressing alarm over their lack of accountability. Justice Anatoly Kononov was likewise forced out after defending Yaroslavtsev. Many who have reported or protested such things have found themselves being repressed - or killed. Journalist Anna Politkovskaya, an outspoken critic of Putin, was assassinated in 2006, and it is widely believed that the Russian government had some involvement in this death. There were 13 journalists killed in contract-style slayings during Vladimir Putin's eight-year presidency. Despite these negatives – or perhaps because of the strong hand they reveal – Putin remains popular in Russia. Since coming to power, Putin has expanded Russia's economy and reduced inflation. The majority of Russians are relatively uninterested in politics outside of issues affecting their personal prosperity, and journalist Anna Politkovskaya argued that the Russian people, as a whole, have been willing to tolerate violence in the name of "comfort and peace and quiet". Conservatives such as Sean Hannity have repeately issued warnings that Putin is a thug and a "bad actor" who cannot be trusted. Initially relations between George W. Bush and Putin were good, with Putin lending passive support to Bush's war on global terror. Putin was restrained from giving much assistance outside the Russian Federation, being pre-occupied with the Islamist movements waging jihad inside his own borders. In Bush's late second term, Putin was concerned about jihadist infiltration from Turkey and Syria through the Republic of Georgia, and intervened. Former members of the Warsaw Pact, who were more supportive of the war on terror than even the US population, then asked for deployment of missile defense systems on their territories, which the Bush administration was inclined to favor as a reward for their help. Russia considered missile defense deployment on their borders overt acts of hostility. Barack Hussein Obama and Hillary Rodham Clinton, in competition to outdo each other, condemned George W. Bush and Condoleezza Rice by sidling up to the Russians and Islamists whom the Democrats portrayed as oppressed victims of a global neocon conspiracy. Targetted Sanctions, from a Moscow art exhibition. President Barack Obama and Secretary of State Hillary Clinton initially cozied up to Putin, charging the Bush administration was intent on reigniting the Cold War. However once the Rosatom-Uranium One deal was completed and the Clinton Foundation pocketed millions of dollars from Putin cronies in donations and speaking fees, relations began to sour as the Obama administration could no longer ignore geopolitical realities. Putin had protested the Obama administrations illegal drone strikes, and the administration placed sanctions on Russian leaders ostensibly in retaliation for the Crimean referendum. President Obama's decision to move an anti-missile defense system to Romania during the 2016 US Presidential election only heightened tensions. Putin, who had repeatedly assailed the antimissile system as a grave danger to Russia's security, called Obama's decision dangerous. This coupled with Obama's implementation of sanctions rather than honor the 1994 Budapest Memorandum on Security Assurances negotiated by the Clinton administration, displaying it as an empty promise to guarantee Ukrainian independence, only further exposed the befuddlement and inability of the Obama administration to stand by US commitments and the weaknesses of NATO. In September 2013, Putin gave a speech stating the need to strengthen Russian culture with traditional values and the Orthodox Christian church. Also, he condemned Western nations and their godless pursuit of political correctness and homosexuality. In early September 2013, Putin expressly observed that liberal John Kerry is a liar. President Donald Trump accused Putin of taking Crimea by force and asked whether Obama was too soft on Russia. In March 2017 the US department of state strongly condemned the arrests of hundreds of protesters against Vladimir Putin's government. The US Secretary of State Rex Tillerson said that US sanctions against Russia will remain in place until Moscow "reverses the actions" it has taken in Ukraine. In response to the April, 4 chemical attack on Khan Shaykhun in Syria, President Trump launched 59-Tomahawk rockets on a Syrian Air base nearby, tensions led up with Russia, Syria's ally, Putin has called that the US attack was an "illegal act of aggression", and answered this attack by sending a frigate to the military base in Syria. In April 2017 Putin explained that the US-Russia relations have gotten worse under Trump, contrary to narratives put out by the liberal mainstream media that Trump is too "soft" to Putin and is Putin's 'puppet' . In December 2017 Putin warned President Trump because of his decision to move the US embassy from Tel Aviv to Jerusalem and stated that he was "deeply concerned". Putin also opposed Trump's withdrawal from the Iran nuclear deal and told that Russia would continue to honor its obligations under this deal. In March 2018, Russian Propaganda video was released showing how a new missile program could be used to attack America. In the video, the state of Florida was specifically targeted. In 2014 Putin founded the Eurasian Economic Union to oppose the European Union. After Crimea was annexed by Russia, the European Union imposed sanctions against Putin and his government. The relations within the EU are different and divided, it is mainly the following countries advocating namely a critical attitude towards the Russian government: the Baltic states (Estonia, Latvia and Lithuania) Poland, Sweden, Netherlands, Germany, France and the United Kingdom, while the following countries belong to the pro Kremlin camp or want to maintain a better relationship: Hungary, Italy and Czech Republic. Also, multiple nationalist parties in the EU appreciate Putin's policies against the Leftist liberal dominance in Europe, like Marine Le Pen's National Front. Despite EU sanctions, Russia under Putin continued expanding economically into Western Europe. Putin's "the decision" is an ambiguous phrase that could include the decision to have the pregnancy in the first place. Also, Putin is very pro-Russia and if thinks abortion is lowering the birth rate in a harmful way, then he could abolish it based on national interests. As someone who rules in the style of the czars, Putin has before called the Bolsheviks traitors for Russia's defeat in the First World War. However, he has also expressed that "[he] liked Communist and socialist ideas very much and [he] like[s] them still." and compared the Soviet code of conduct to the Bible. Putin also has compared communism with Christianity. Putin was accused of embracing the tactics of Soviet dictator Joseph Stalin. In addition, he implies in an interview with Larry King dated September 8, 2000 that his Christianity isn't actually sincere by stating in Russian that he "believes in the power of man" or "I believe in human beings." Furthermore, around October 2017, he hosted the 19th World Festival of Youth and Students Communist event and gave a speech that strongly implied that he adhered to Communism. Similarly, he also had provided arms and materiel to various communist groups, including Angola, and has voiced a desire to reconnect with Latin America shortly before the FSLN regained power in Nicaragua and has supported Nicaragua via foreign aid, shipping tanks, and even posting a GLONASS tracking station on the Caribbean coast, alongside similar arming of North Korea. He also indicated that he still keeps his KGB card while citing his contemporaries within the KGB had discarded theirs after the USSR's fall. In January 2018 Putin said that "[t]raditional Islam is an integral part of the Russian cultural code". He also vowed to support Islamic religious education. Putin has openly endorsed his Muslim puppet dictator in Chechnya, Ramzan Kadyrov. Kadyrov has de facto established Sharia law in the region and was condemned by the international community for slaughtering gay citizens. Chechen authorities have imposed a compulsory Islamic dresscode for women. "Anyone who doesn't regret the passing of the Soviet Union has no heart. Anyone who wants it restored has no brains." Robert Kraft, the owner of the New England Patriots, accused Putin of stealing Kraft's Super Bowl ring. Putin responded that Kraft gave it to him as a gift. ↑ Putin was later elected president by 54% of the electorate on March 26, 2000. ↑ Putin 'deeply concerned' by Trump's Jerusalem move. IsraelNationalNews. December 18, 2017. Retrieved August 31, 2018. ↑ Putin Criticizes Trump Over Iran Nuclear Deal. Haaretz. June 10, 2018. Retrieved August 31, 2018. ↑ Why would Putin want to nuke Florida? ↑ Strobel, Warren P. (March 11, 2019). Russia’s Economic Clout in Europe Grows Despite Sanctions, Study Says. The Wall Street Journal. Retrieved March 11, 2019. ↑ Newman, Alex (January 16, 2018). Communism “Very Similar” to Christianity, Putin Claims. The New American. Retrieved January 17, 2018. ↑ Parfitt, Tom (December 23, 2007). Spy who came in from the cold. The Guardian. Retrieved September 15, 2018. Horowitz, David, Putin and the shadow of the KGB on the Glazov Gang, Sherman Oaks, California: David Horowitz Freedom Center, Published April 5, 2013. This page was last modified on 9 April 2019, at 19:09. This page has been accessed 83,099 times.